Yesterday’s post gave us a glimpse of the painstaking process behind taming a feral cat. However, as we mentioned this isn’t always the best option for a feral cat. They are basically wild, and that can mean very unsociable. Not only can they be physically hazardous, but pathologically too. Feral cats are known carriers of many dangerous diseases that can infect domesticated cats and humans. Rabies, distemper, feline aids, and Toxoplasmosis are all fairly common in stray or feral populations. So simply being friendly to a family of feral cats and kittens isn’t always going to resolve the situation. You’ll need to catch the cats and have them treated or relocated. To successfully cat-nab you’ll need to either procure or rent an effective trapping mechanism. You can either purchase one online or rent from your local humane society, animal control shelter, or a veterinary office. Then you’ll have to set the trap up in a high traffic area for the feral feline population, bait it so as to make it more appealing, and finally it’ll be time to sit and wait while the trap is sprung. Be certain that you set up the trap correctly by following any and all directions that come with it. Cover the bottom of the trap with cardboard or an equally appealing surface for a cat. They find the wire unnatural and uncomfortable. Cover the outside as well. Use a towel to enclose every side but the opening. This will help manage the cat’s stress once caught. There are plenty of different effective types of bait such as tuna, sardines, wet cat food, cat nip, and various sorts of meats. Once you’ve caught the kitty it’s time to decide what to do with it. There are several options. You can try to adopt the cat out, but as we discussed in yesterday’s post, socializing a feral cat is no easy task, and your chances of doing so successfully while the cat is in captivity are very low. The ideal thing to do is TNR. 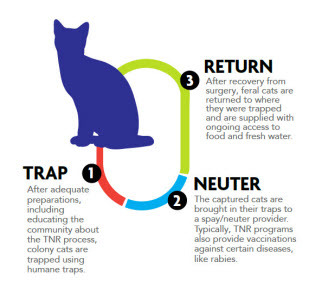 TNR stands for trap, neuter, and release. Before catching your cat, you should schedule a vet appointment. That way you can get the cat in and out as soon as possible, thus minimizing its stress. Once the cat is caught, take it in the following morning, have it fixed, treated for as many diseases as your budget allows, and release it after leaving. Even if you don’t treat the cat for pathogens, it won’t be able to procreate and pass diseases on to its kittens. If you decide to take the feral cat into an animal shelter, you should keep in mind that you’ve basically issued a death sentence. There is an abundance of domesticated cats in these shelters, and no room budget for cats with behavioral issues. That concludes our advice on feral cats. Make sure to come back and visit the Petbucket blog for more helpful advice on various animal issues.